The year is 1984 and the city is Tokyo. A young woman named Aomame follows a taxi driver’s enigmatic suggestion and begins to notice puzzling discrepancies in the world around her. She has entered, she realizes, a parallel existence, which she calls 1Q84 —“Q is for ‘question mark.’ A world that bears a question.” Meanwhile, an aspiring writer named Tengo takes on a suspect ghostwriting project. He becomes so wrapped up with the work and its unusual author that, soon, his previously placid life begins to come unraveled. As Aomame’s and Tengo’s narratives converge over the course of this single year, we learn of the profound and tangled connections that bind them ever closer: a beautiful, dyslexic teenage girl with a unique vision; a mysterious religious cult that instigated a shoot-out with the metropolitan police; a reclusive, wealthy dowager who runs a shelter for abused women; a hideously ugly private investigator; a mild-mannered yet ruthlessly efficient bodyguard; and a peculiarly insistent television-fee collector. I have just spent the last three weeks working my way through the eagerly anticipated English translation of 1Q84 by Haruki Murakami. The English translation of this best selling novel includes all three parts of the novels that were originally published separately in Japan. The chapters alternate between two characters, Aomame and Tengo, for the first two books. In book three the chapters follow three characters, Aomame, Tengo, and Ushikawa. 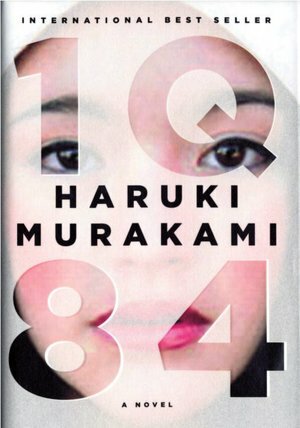 Set in 1984, or the alternate reality of 1Q84 (the Q stands for "question mark"), the novel is science fiction but mostly a story about two people who are drawn into an alternate reality and, eventually, begin searching for each other. Aomame is a physical trainer and assassin. Tengo is a math teacher and writer. Aomame enters the alternate reality while on her way to a planned assassination. Tengo enters it after he accepts the assignment of rewriting Air Chrysalis, the debut novel of a young writer. At the beginning, the stories of Aomame and Tengo are separate. About halfway through the novel we learn of their connection and the stories begin to join together. 1Q84 explores the nature of reality - how one's perspective can alter reality and how events are viewed. What is reality for you may not be for someone else. We may all be living in parallel universes, pursuing personal meaning in our own lives. It also explores fate, powerlessness, fringe religious groups, free will, domestic violence, and vengeance. I'll admit, at the conclusion, to mixed feelings about 1Q84. With the entire pre-publication buzz surrounding 1Q84, I was looking forward to an alternate reality science fiction novel. While it fits that description, it also is filled to a much greater extent with the trivialities of everyday life in the alternate reality, and those mundane activities are very much the same activities we would all encounter. There were tantalizing bits of surreal information disclosed and then pages of the banal activities of the everyday life of the characters. While I read all 900+ pages during some very busy weeks, it soon became clear that 1Q84 by Haruki Murakami is not really that com­plex, but it is a very long novel. This feeling that it is excessively lengthy could be because it was originally published as three novels in Japan but one very large novel here. The repetition of information and descriptions makes the novel feel overly wordy when the three books are published as one novel. In the end I liked 1Q84, but it is not the novel of the year that I was looking forward to reading. Highly Recommended - when you have the time and patience to tackle it. "And also," the driver said, facing the mirror, "please remember: things are not what they seem." Things are not what they seem, Aomame repeated mentally. "What do you mean by that?" she asked with knitted brows. The driver chose his words carefully: "It's just that you're about to do something out of the ordinary. Am I right? People do not ordinarily climb down the emergency stairs of the Metropolitan Expressway in the middle of the day—especially women." 1Q84 - that's what I'll call this new world, Aomame decided. Actually, I'd say it was published as two novels in Japan. Books 1 and 2 were published together at the same time, and Book 3 came later. Some thoughts on how that affects my reading of 1Q84 here. Very interesting, Joel... I'd have to say that I agree with your thoughts on your blog, however, I standing on my statement that 1Q84 was originally three novels. Even if 1 and 2 were published together it was acknowledged that they were 2 novels.